What are the schooling options for children? Home/Family, Featured/What are the schooling options for children? There are currently twelve families with children and seventeen married couples at Sias. Currently there are about 12 children under 10 and 8 between 10 and 19. Do you have Children ages 3-5? 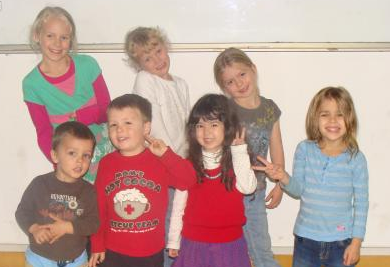 You can send them to Sias International Kindergarten. Classes start at 8:30. They have a break from 10-10:30 then another 35 minutes of classes. Lunch is served at 11:05 followed by outside playtime. Followed by nap time from 12-2. Then they have music, art or watch a movie. Another break/playtime is from 3:30-3:50 which is followed by dinner and parents begin arriving at 4:30 to pick them up. Chris and Yuki send their daughter to the kindergarten. They only send their daughter until lunch because of the School that was started this year for the children of Foreign Faculty. The FFCS (Foreign Faculty Children’s School) offers Chinese, music, dance and PE. It is a part-time school. School is for half a day Monday to Friday in the afternoons. All the tuition is free for families on staff at Sias University. Parents need to pay half the cost of the the uniforms. But other than that, there is not charge for other things. Contact Effi Groff at effigroff@gmail.com for more information. We use Keystone because it is fully accredited in all the states. This will ensure a normal transition from school to college…no extra testing! It is expensive but it is worth every dime because of the accreditation. The beauty of the program is that this is on-line learning not home schooling! Above is the website where parents can see age/grade appropriate materials about Keystone. I love it as a parent and Alex loves it too. I get reports every 2 weeks and conferencing once a month… if I choose. As you know, we have Chinese classes for the kids, PE, and dance each week too. I do not need to record or have transcripts for my kids until they are in high school so I have chosen to use my own materials from a variety of sources here from the Sias shelves and handed down from my oldest son and friends. I do not have the time to grade all my childrens’ work too closely so this year we chose Jubilee Academy which is an on-line home school curriculum that shows the written lesson daily and takes the student to various websites and sells CD’s to have the students view. These sites are not the most current and the CD’s sometimes don’t work and the lesson is sometimes short of information that does not adequately prepare my kids for the tests at the end of the lesson. I have had many small disappointments with Jubilee but it is a good faith-based course. For more money one can choose Liberty Acadamy online school for it is also accredited with college tuition credit and is a strong faith-based company. Read more about teaching, community, adventures, and food in our FAQ. Aaron grew up in the Bay Area, California. His father worked as a pilot for commercial airlines and from a young age, Aaron began traveling globally. While attending Cal Poly (SLO) he volunteered as a youth mentor and currently spends free time serving through CEO Global USA programs. He met Rachael in 2007 shortly after both of them completed their MA degrees and within a year they were married and moved to China. They now have four children who consider Peter Hall faculty housing their “home” even though they are on the road 6+ months of the year outside of China.